Stunning three bedroom mid terrace property with a modern open plan layout within a popular residential area. 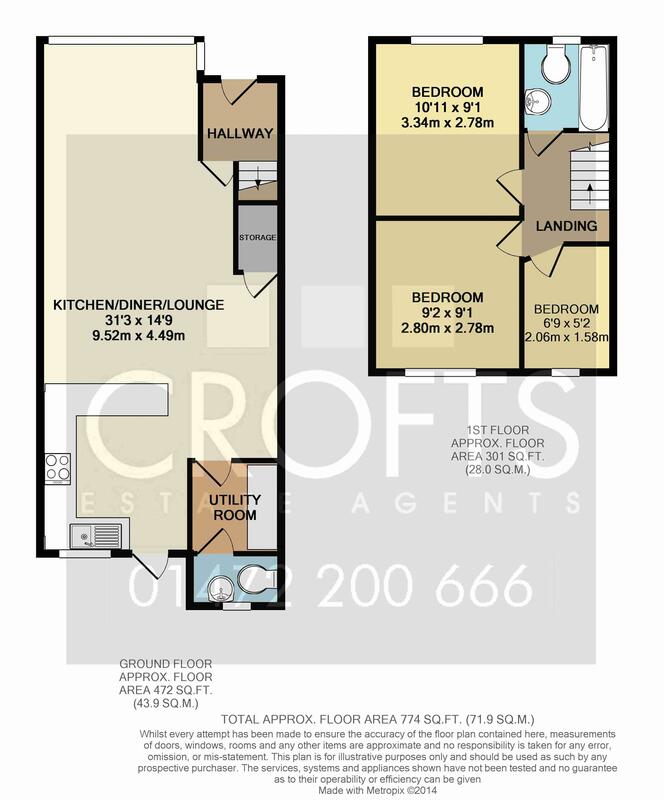 The ground floor of the property consists of large living room, diner and kitchen area with a separate utility room and cloakroom. The upper floor of the property has a modern bathroom with bath, along with 3 bedrooms. The property benefits from gas central heating and UPVC double glazing as well as attractive low maintenance gardens to the front and rear. Working tenants only. Stunning three bedroom mid terrace property with a modern open plan layout within a popular residential area. The ground floor of the property consists of large living room and diner, and kitchen with a separate utility room and cloakroom. The upper floor of the property has a modern bathroom with bath, along with 3 bedrooms. The property benefits from gas central heating and UPVC double glazing as well as attractive low maintenance gardens to the front and rear. Working tenants only. Entered through a UPVC double glazed door the hallway has a modern laminate floor and a carpeted flight of stairs rising to the first floor. Door leads to. THis stunning room is sure to impress. With a modern open plan layout the room is defined into three areas with a lounge area to the front of the property with the benefit of a walk in bay fitted with a leaded UPVC double glazed window. To the centre of the room is a dining area with ample space for a family size dining table and chairs. TO the rear of the room a kitchen area is fitted with a stunning range of matcing wall and base units with a modern cream high gloss finish. High gloss work surfaces fitted over complement the kitchen explicitly. Splash tiling to the walls. Inset kitchen sink with drainer and mixer tap, fiver ring gas hob with a chimney style extractor fan and a single electric oven. Ample space for a larder style fridge freezer. This lovely contemporary space is finished with modern ceiling down lights, laminate flooring and neutral tones to the walls complemented with a feature wall adorned with modern decor. To the rear a UPVC double glazed door and UPVC double glazed window. A valualbe addition for ant home this lovely cloakroom is fitted with a matching two pice suite comprising wall hung hand basin and a low level flush W.C. Modern decor, laminate floor and a UPVC double glazed window. With a carpeted floor the landing allows access to. The second double bedroom to the rear of the property has a carpeted floor, central heating radiator and a UPVC double glazed window. The study room has a carpeted floor, central heating radiator and a UPVC double glazed window. To the front of the property the bathroom is fitted with a modern white three piece suite comprising low level flush W.C, wall hung hand wash basin and a panelled bath with a shower attachment over and a fixed shower screen. Tile effect cushioned flooring, chrome ladder style towel warmer and a UPVC double glazed window. Standing back from the road the property has a low maintenance front garden laid with decorative gravel and a timber fence securing the boundary. The rear garden is laid for ease of maintenance with a timber decked area to the rear of the garden creating a pleasant seating area. The boyundary is secured with timber fencing. Stunning three bedroom traditional mid terrace property. Modern open plan layout to the ground floor. Separate utility room and a ground floor cloakroom. First floor bathroom with a shower attachment over the bath.